The Holy See pavilion at the International Architecture Exhibition of Biennale di Venezia is composed of ten chapels designed by ten world-renowned architects from all over the world and hosted by the Giorgio Cini Foundation in the park of the island of San Giorgio Maggiore, in Venice. Before the construction of the chapels, careful investigations were carried out on the trees of the park, to verify what areas would be the most suitable to host them, and to work so as to improve the park itself and its walking paths. Let’s now return to Vatical Chapels. Yesterday, our visit ended with the chapel designed by Javier Corvalán. Just a few steps away, we can admire the project by Norman Foster, a steel structure supporting a series of wooden slats. The English architect said he carefully chose the site himself, which is close to two trees framing a splendid view of the lagoon of Venice. In this natural context, he designed a space for contemplation where visitors, surrounded by a play of light and shadow, can leave the path to focus on the sky and the water. The chapel designed by architect Andrew Berman has a triangular shape and 7-metre long walls and is made with laminated timber. The open front part of the building is a covered porch where a wooden bench invites visitors to gather and meet. After entering the chapel, they will find themselves in a small structure which favours introspection. In the east-most part of the park is the chapel designed by architects Ricardo Flores and Eva Prats (Flores & Prats Architects - Barcelona). The Morning Chapel, as they called it, is oriented so as to collect the first rays of the morning sun through a circular opening in the wall. Apart from this semi-curve space, the chapel is composed of a wall parallel to the path, provided with a door. The architects designed it as a place where to seat and rest. After crossing the door, visitors can reach the forest. Architect Francesco Cellini designed a rational structure, resulting from the intersection of two parallelepipeds with a rectangular basis that only partially rest on the ground, which is mostly left untouched. The chapel is covered by porcelain stoneware slabs that create a strong chromatic contrast. For his chapel, Chilean architect Smiljan Radić was inspired by typical Mexican votive altars and experimented innovative solutions as regards the choice of the materials used. As a matter of fact, the particular internal texture of the chapel was obtained inserting pluriball papers in the cement formwork. The central trunk without bark is the vertical support of the burnished steel beam which in turn supports a glass cover and completes the cross. The chapel realised by Australian architect Sean Godsell is quite a strong symbol, despite the illusory simplicity of the project. With a tall steel parallelepiped with an opening in its lower part which creates a cross in correspondence with the altar, the architect transformed the surrounding natural environment, making it become part of the chapel liturgical space. The internal part of the volume, made of steel and painted in gold, ensures that the altar and the priest are illuminated by a different kind of light. 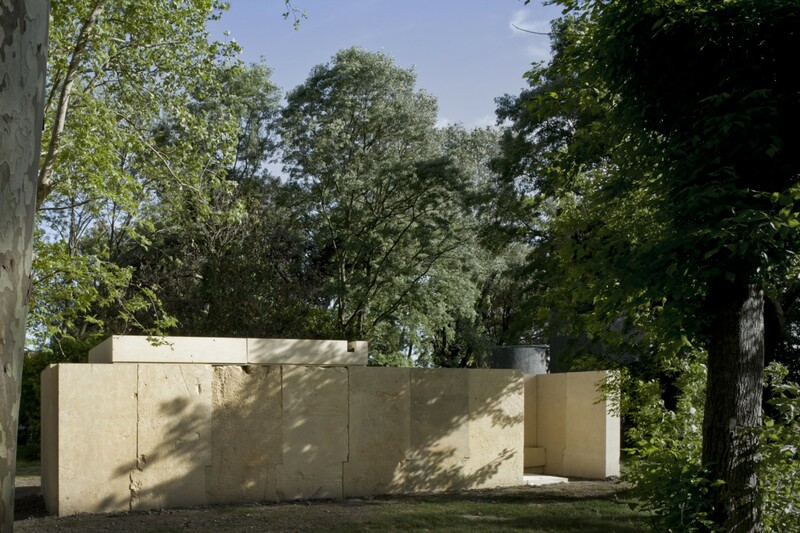 A few thick and solid elements in Vicenza stone create the sides of the chapel designed by Souto De Moura, partially covered by monolithic slabs. This chapel is essential, and nothing is left to chance, such as the seating created along the wall, or the light that enters from the covering, attributing even more importance to the cross, drawn on the back wall. 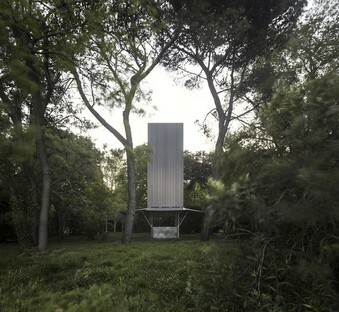 The project by architect Carla Juaçaba features polished steel beams that mirror the surrounding natural landscape, almost hiding themselves in it, while at the same time transforming it into a place devoted to prayer through simple elements creating the symbol of the cross and an area where it is possible to rest. The images of the building sites, the drawings and the sketches that document all the projects of the Holy See pavilion are collected in the Electa catalogue, curated by Francesco Dal Co.